Grilling Recipes don't need to be fancy to satisfy the family. When all is said and done, that's what matters right? I love when my 4 year old thanks me for dinner. Now that I have a new born, grilling recipes tend to be very stripped down. It's kind of hard to think ahead for dinner on a few hour's sleep, not to mention a little risky mixing up a marinade with a baby in your arms (think about it, blah...). So keeping with the "grilling recipes don't have to be hard" theme, we'll focus on technique this week while producing some delicious grilled pork chops for dinner. Like chicken breasts, pork chops are a favorite freezer dweller for me. Thin and lean pork chops thaw out relatively quickly, making them perfect to keep on hand for last minute dinner grilling. Rub on a little fresh ground black pepper, some garlic power and kosher salt and boy-oh-boy, you've got the potential for a great dinner of grilled pork chops...as long as you don't screw them up on the grill! 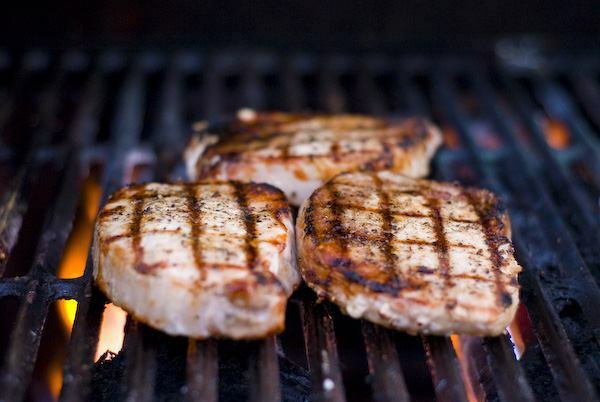 Let's get to grilling these pork chops. 1Again, we are going to keep this simple, so rub those pork chops with some kosher salt, fresh ground black pepper and a little garlic powder and them sit on the counter. We always want to let our meat rest at room temperature for about 30 minutes before grilling. This time to warm up from the refrigerator helps them cook more evenly. Don't let chicken or pork sit out longer than 30 minutes and make sure we are talking a counter in an air conditioned place! 2Preheat the grill on high heat. 3Clean the grill and oil with some tongs and cooking oil soaked on a folded paper towel. 4Now place the pork chops on the hottest part of the grill. We want to sear these pork chops and cook them rather quickly. 6So now that you have flipped the pork chops over to the other side, grill for as long as it took them to start to turn opaque on the first side. 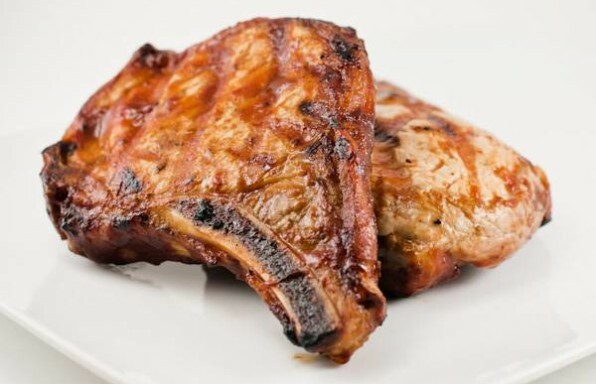 7Remove the grilled pork chops from the grill and ALLOW THEM TO COOL FOR 5 - 10 MINUTES. This allows the juices to redistribute, so that they don't all run out when you cut into the chops. See, grilling recipes don't have to be complex. Grilled pork chops can be simple and yet delicious as long as you pay attention to technique. Try the visual clues we talk about in this recipe. After a while, you won't have to use a thermometer, though I am not saying that is ever a bad thing (just don't punch too many holes in the meat!). So go out and stalk up on pork chops next time they are on sale. A good freezer full of these fast thawing meal makers may save your next dinner! “a little kosher salt, fresh ground black pepper and a little garlic powder” actually means in terms of proportions and how much to use. I’m going to look around on the web first and see if someone else says, then give it a try. Best pork chops I’ve ever made. Very moist no sauce needed. Perfect quick dinner. 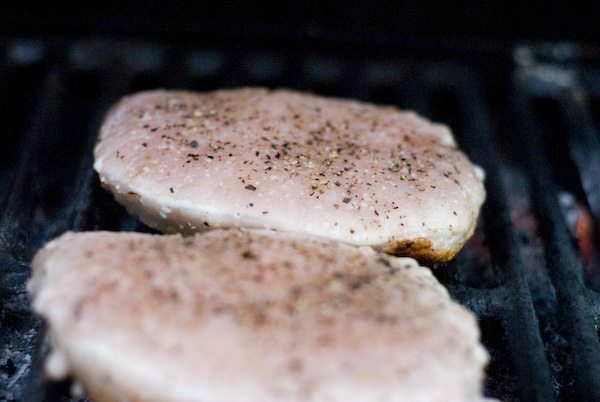 And yes…a little pink in the center of pork chops or loin is fine! Totally trying this tonight! Sounds simple enough! Is it ok to just use seasoned salt??? I hope so! Works very well. Was a bit concerned about cooking them to what the thermometer said is appropriate for pork – 170 degrees. I figured that 160 sustained was good enough and they did have 2 thicknesses so one did get to 170 and the thicker was a bit over 160 in the middle. Turning out tender and very good I will definitely try this again. I used what I had. Some Italian dressing, garlic salt, some pepper, and some McOrmic steak seasoning. Worked out great. A repeat performance will occur for sure. A question about a little pink near the bone (these had bone in) so I didn’t eat the pinkish meat near the bone. Hopefully our stomachs will be fine tomorrow. Any tips/tricks are welcome.